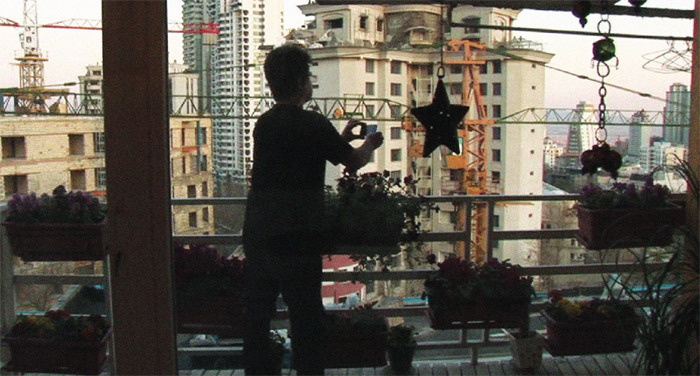 Jafar Panahi and Mojtaba Mirtahmasb, This Is Not a Film, 2011, still from a color video, 75 minutes. Who would seriously contend that the collection of intersecting lines above the text is a pipe? Smuggled out of Iran on a USB thumb drive concealed inside a cake, This Is Not a Film was titled to confoundbut whom? Was it the Iranian authorities, who, in any case, are free to interpret Panahi’s “effort” (as the end titles describe it), a collaboration with the documentarian Mojtaba Mirtahmasb, however they wish? Was it the festival audience, who seemed pretty much knocked out by Panahi’s resourcefulness, honesty, and conceptual intelligence? Or was Panahi, a practitioner of Iranian neorealist self-reflexive cinema (The Mirror ), whose deceptively modest movies (The White Balloon , Crimson Gold ) can be both blatantly metaphoric and powerfully concrete (The Circle , Offside ), addressing himself? This Is Not a Film redeems the well-worn cliché that modern art should be largely concerned with the conditions of its own making. Not that it is a straightforward recording; although the action appears to unfold on the noisy eve of the Persian New Year, which coincides with the first anniversary of Panahi’s arrest, it was actually shot over a ten-day period, and hence is nonsequential. The opening image is of an empty kitchen table in a comfortable, modern high-rise with an impressive view of the Tehran skyline. Panahi enters, sits down, and phones Mirtahmasb to come over: “I have a few ideas I want to tell you about.” Cue the title. It is apparent from the beginning that Panahi is not himself using the camera. Either his family members have turned on the device and left it running or Mirtahmasb, whose presence is as yet unindicated, has been shooting the filmmaker as he makes tea, feeds his daughter’s pet iguana, and takes a phone call from his lawyer. Soon, however, Panahi is experimenting with ways to make a film without seeming to direct his cohort. “Do you remember The Mirror?” he asks, cuing a cut to the scene in which that movie’s subject, six-year-old Mina, breaks character and announces that she’s finished acting. The next shot shows the crew, the director among them. Watching his own movie, Panahi remarks that he’s now in the same position as Mina, giving an inauthentic performance. Next he begins reading from, diagramming, and finally acting out a screenplay never approved for production, hoping that “perhaps the viewer will see the film that wasn’t made.” We do. The scenario concerns a young woman whose parents lock her in the house to keep her from registering for university. The project was intended to be shot entirely in interiors. In fact, there’s a bonfire ablaze beyond the gate. The director has gone as far he can, perhaps farther. I cannot gauge the risks Panahi took or fathom the courage necessary to produce that which I have now seen several times. I can only note that the effort called This Is Not a Film is something more than a filmwhich is not to say this isn’t a review. This Is Not a Film is playing at Film Forum in New York through March 13. J. Hoberman was a film critic at the Village Voice for more than thirty years. His forthcoming book is titled Film After Film.